Brown-headed Cowbird, Molothrus ater: The "Black Vagabond"
Come April each year, we're always delighted as the first spring migrants begin appearing at Hilton Pond Center. Blue-gray Gnatcatchers, Eastern Phoebes, Indigo Buntings, and Ruby-throated Hummingbirds are among our earliest arrivals, and there's always a big spike in the number of Chipping Sparrows visiting our feeders--although we haven't determined if these little rusty-caps migrate in or are local residents with sudden yearning for white millet. Another species that seems to crave millet is one whose presence we welcome because of its fine plumage but would rather not have around due to its lifestyle. 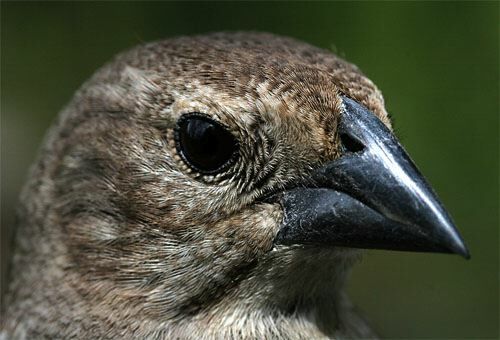 We speak here of a "Black Vagabond"--the Brown-headed Cowbird--a social parasite whose proclivity for depositing eggs in other birds' nests can have significant impact on songbird populations. Brown-headed Cowbirds (male, above) have been seen around Hilton Pond in all months of the year, but never predictably nor in large numbers. During cold weather they tend to congregate with other blackbirds, so it's not unusual a few times each winter to have a flock of a thousand Common Grackles, Rusty Blackbirds, and cowbirds descend on the property to plow through dead leaves in search of seeds and invertebrates. Usually, about 95% are grackles and sometimes a few European Starlings are in the mix. When spring approaches, these foraging flocks disintegrate as former participants start hanging with their own kind. Most of the blackbirds eventually pair off, but Brown-headed Cowbirds have a different social system--one in which both sexes are promiscuous. In fact, we've found one of the best ways to catch male cowbirds is to use live females as bait. Many times a female in one of our ground traps have attracted the attention of a half-dozen or so males who got snared themselves when they tried to get at a potential mate. Although some birds remove cowbird eggs from their nests, many such as vireos and warblers simply incubate the cowbird egg with their own. The cowbird egg develops--often getting a head start by hatching a day ahead of its nestmates--and the cowbird chick quickly becomes the dominant bird in the brood. Since surrogate parents feed the aggressive cowbird first, it grows more rapidly and achieves maximum size--perhaps two or three times that of its foster mother and father. If you're a diminutive warbler, it may take all your energy to raise this giant, gluttonous interloper--especially since a cowbird fledgling (left) will continue to beg for food and might prevent foster parents from having a second brood. This scenario has caused birds such as the once-common Yellow Warbler to undergo significant population reductions--so much so that some songbird species have vanished from parts of their original range. 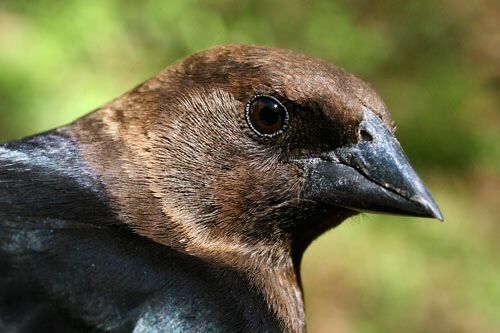 Birdwatchers and environmentalists sometimes debate whether Brown-headed Cowbirds are "native" to the Carolinas, or whether human activity has drawn them in from elsewhere. We frequently refer to them as "buffalo birds" to emphasize they likely originated in the Great Plains, where they followed American Bison from place to place, eating insects stirred up by grazing herds. (As a reflection of this, Lewis and Clark referred to cowbirds as "buffalo-peckers.") However, there WERE expanses of prairie in the Carolina Piedmont--especially in the vicinity of the modern-day counties of York (SC) and Mecklenburg (NC); there also were a good many bison in the Carolinas prior to the arrival of European settlers. It's quite interesting that when the Brown-headed Cowbird was first described by science, the description was based on a specimen collected in South Carolina by early French explorers and written up by naturalist Louis-Jean-Marie Daubenton (1716-1800). He called the cowbird Troupiale, de la Caroline--the Carolina Oriole--an appropriate name because brightly colored orioles, like cowbirds, are in the Blackbird Family. 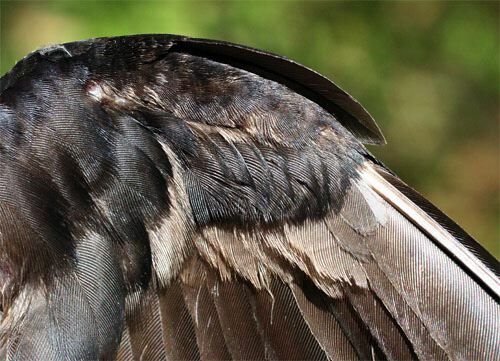 This Bird is entirely brown, the Back being darkest, and the Breast and Belly the lightest part of it. In Winter they associate with the Red-wing'd Starling and Purple Jack-daw in Flights. They delight much to feed in the Pens of Cattle, which has given them their Name. Not having seen any of them in Summer, I believe they are Birds of Passage. They inhabit Virginia and Carolina. 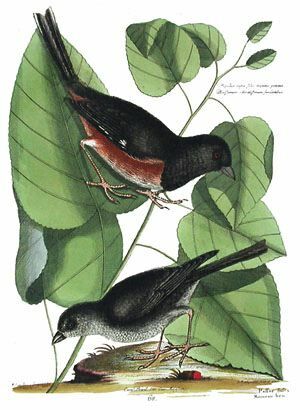 NOTE: We wonder if Catesby depicted together the Eastern Towhee (which he called Passer Niger, Oculis Rubris or "black bird with red eye") and the Brown-headed Cowbird (Passer Fusca or "dusky bird") because he thought they were somehow related. In reality, towhees are sparrows (Emberizidae) and cowbirds are blackbirds (Icteridae), but because both have black bills that are more or less conical, these two ground-feeding birds might look superficially similar. Obviously, based just on the work of Catesby and Daubenton, there were at least small populations of cowbirds present in Colonial America, but we suspect across the eastern U.S. they are much more common today than 275 years ago. Humans have altered the landscape significantly, cutting down dense forest and replacing it with farmland and grazeland more suitable to cowbirds. Most important, habitat fragmentation has enabled cowbirds to enter areas where they did not occur historically; not only is there more space but now they can parasitize nests of new species they never encountered on the Great Plains or Piedmont Prairies. 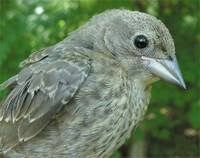 Unlike prairie nesters, these new victims--especially woodland breeders--did not evolve with cowbirds as social parasites, so they likely have no natural defenses against such parasitization. 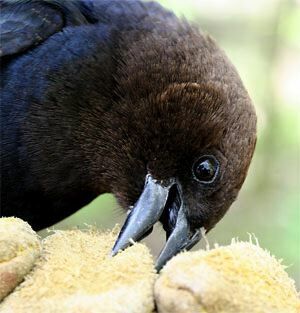 Although some birders have knee-jerk reactions against the cowbird's parasitic behavior, having the bird in the hand gives a different perspective. 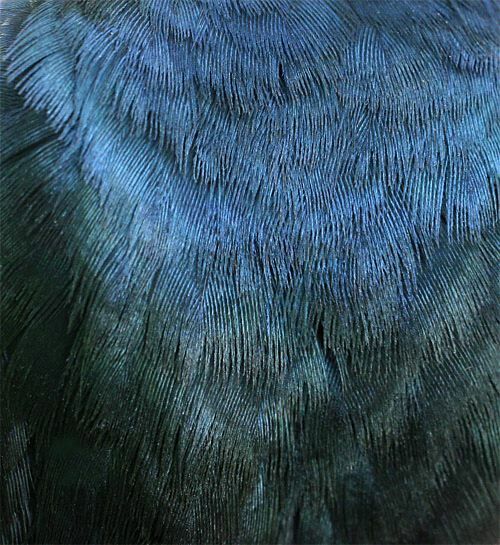 The seemingly black dorsal plumage of the male Brown-headed Cowbird becomes a metallic abstraction (above), with shades of cobalt blue and green glinting like gun steel. 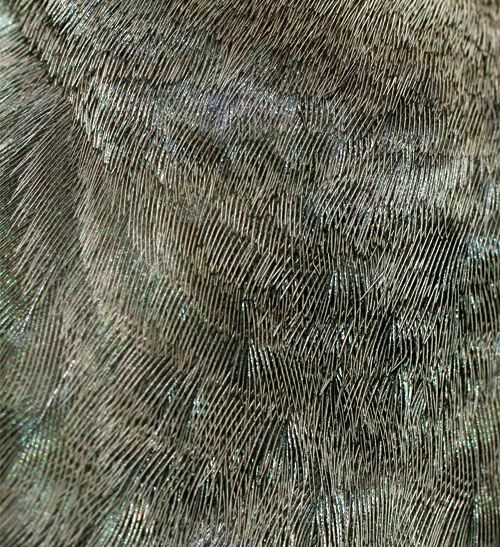 The female's back feathers (below)--more loosely structured--are drab by comparison, but even they have hints of greenish iridescence. Nonetheless, the overall mousey gray-brown color of the female cowbird undoubtedly makes her less noticeable as she spies on potential nests in which to place her eggs. So how did Brown-headed Cowbirds become social parasites in the first place? One hypothesis is that following buffalo herds made cowbirds true wanderers; such a lifestyle interfered with nest-building and made it advantageous to be able to lay eggs that other species would end up tending. However, other kinds of birds also have been known to lay an egg in the nest of foster parents, and none of them follow grazing animal herds. It seems more likely social parasitism arose because gravid female birds have to put the egg somewhere; if a female is far from her own nest when her egg is ready--or if her nest was destroyed by a predator or weather--the female might seek out another's nest for the deposit. If her chick then survives under care of foster parents, over time such serendipitous egg-laying might become the norm and, eventually, a necessity. Any bird that lays an "extra" egg in the nest of another pair is technically a social parasite; cowbirds merely take the behavior to the extreme, including not ever building a nest of their own. There's no question their non-nest-building lifestyle has enabled Brown-headed Cowbirds to do pretty well in a changing environment. Experts with Partners In Flight estimate there are 56 million cowbirds in the U.S., Canada, Mexico, and parts of the Caribbean, placing them in the category of "Least Concern" with regard to survivability. And many cowbird individuals are assertive--witness our need to wear a leather glove to photograph one especially aggressive male (below left)--which means they get at least their share of food when they flock together with other blackbirds and starlings. Females are careful observers of other species when they need nests in which to lay their eggs, but cowbirds are even more resourceful than one might think--as discovered recently by Jeffrey Hoover and Scott Robinson. The two ornithologists described a "cowbird mafia," i.e., female cowbirds that "trash" nests from which the host bird has removed a cowbird egg. Such behavior "encourages" protective host birds not to mess with a cowbird egg lest their own future progeny get roughed up. Furthermore, some female cowbirds destroy a nest and steal the host's eggs BEFORE laying their cowbird eggs, thereby forcing the host to build a new nest. Since second clutches are typically smaller, this may mean fewer host bird nestlings are present to compete when the cowbird finally lays her own egg in the newly constructed nest. Love 'em for the color and unusual gurgling song, or hate 'em because they lay eggs in the nests of other birds, one has to admire Brown-headed Cowbirds for their resourcefulness and survival skills. With 56 million of them scattered around the Western Hemisphere, we suspect they are here to stay, so we might as well study them a little more closely to see what other secrets they might reveal. To that end we've banded 361 cowbirds at Hilton Pond Center since 1982, with 90 of those captured between January and June 1988; none ever returned in a later year or showed up elsewhere. One thing we wonder is whether--with all those male cowbirds trying to breed promiscuously with all those females--who actually gets to mate? Can younger, second-year males--identifiable in-hand by the pale and sometimes ragged condition of their underwing coverts (above)--still impress a female when they spread their wings in courtship display, or do only older males have the right moves to win over a female long enough to copulate? To us these are interesting questions whose answers might be easier to acquire at Hilton Pond if our Brown-headed Blackbirds weren't such vagabonds with no place they call home. If you ever shop on-line, you may be interested in becoming a member of iGive, through which nearly 700 on-line stores from Barnes and Noble to Lands' End will donate a percentage of your purchase price in support of Hilton Pond Center and Operation RubyThroat. We've just learned that for every new member who signs up and makes an on-line purchase within 45 days iGive will donate an ADDITIONAL $5 to the Center. Please sign up by going to the iGive Web site. It's a painless and important way for YOU to support our work in conservation, education, and research. --The devastating Easter freeze we described in last week's essay did indeed knock off most tender new leaves on our big trees at Hilton Pond Center. 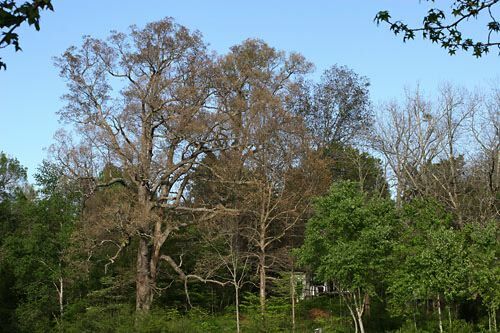 The photo above shows a verdant herbaceous and shrub layer, but the canopy and subcanopy--mostly White Oak, Southern Red Oak, Pecan, Black Walnut, and Shagbark Hickory--are dead and brown. We have noticed signs of life on a few canopy trees, mostly from leaf buds that hadn't opened before the cold snap; Sweetgums and Red Maples seem mostly unaffected by the cold. --Our first Ruby-throated Hummingbird showed up at the Center on 31 Mar, but we didn't capture one--a male with full red gorget--until 16 Apr. We also caught our first return that day, a second-year male banded 27 Jul last year. We sighted our first female RTHU on 14 Apr. --Although female Brown-headed Cowbirds don't develop a brood patch--after all, they don't incubate their own eggs (see this week's essay)--several other birds we trapped this week at Hilton Pond showed signs of breeding activity. Many of our male Chipping Sparrows have significant cloacal protuberances in which sperm are stored temporarily, and females of several species (especially Northern Cardinals and House Finches) have lost their belly feathers and developed incubation patches. These patches of bare skin also become edematous (filled with fluid) and vascularized (increased blood capillaries)--all of which helps transmit body heat to eggs more efficiently. Curiously, the most prominent brood patch was on a MALE Downy Woodpecker we banded in 2004 and recaptured this week. In this species, both parents share incubation duties, and both acquire brood patches during the nesting season. --A female Northern Cardinal recaptured this week (with brood patch) was banded as an after-hatch-year bird in May 2000, which means she's AT LEAST eight years old and one of the oldest known birds at Hilton Pond Center. A female American Goldfinch banded in Feb 2001 isn't far behind.